I have to admit, I was a little surprised when I ran a search on Fighting Fantasy and got no proper hits. As I presume a lot of us here are mid 30s+, I would have thought that a lot of us would have a love for collecting these as much as we do the videogames of yesteryear. Over the last 12 months I have bought them all, the gamebooks (approx 70), guides, novels, maps, all of it. 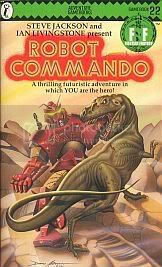 Since the day the book club magazine came to our Junior school in 86 and I asked my Mum for Robot Commando I have been hooked. Where else would a 10 year old kid get to pilot a bipedal/aeroplane transforming mech through a post-apocolyptic wasteland and fight dinosaurs and other robots? 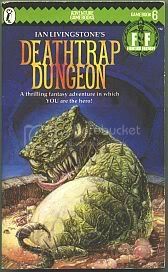 I was super excited last month when Ian Livingstone whom I follow on Twitter announced a new one this year to celebrate 25 years of the series! Anyways, who else collected, or still collects these books? I used to read them a lot even though I grew up in the 90s, not the 80s. I almost had a complete set, but I got rid of them all a couple of years ago. I always used to keep my fingers on the pages in case I died. Does anybody remember a couple of C64 games that came with a couple of similar books? The main character wore a green hooded cloak, and you had to choose your powers at the beginning of the book. noobish hat wrote: I used to read them a lot even though I grew up in the 90s, not the 80s. I almost had a complete set, but I got rid of them all a couple of years ago. I always used to keep my fingers on the pages in case I died. Ah that was it. There were only two in that eries right? I think I had them both. Not bad as I recall. I think I remember being killed in the book by some weird plant monster that came out of a wardrobe. Though that might have been Knights of Doom now that I think about it. noobish hat wrote: Ah that was it. There were only two in that eries right? I think I had them both. Not bad as I recall. I think I remember being killed in the book by some weird plant monster that came out of a wardrobe. Though that might have been Knights of Doom now that I think about it. There were 2 on the c64 (and possibly Spectrum) I think but bookwise there have been 30 so far with the newest out this year!! God, I loved these books....especially the "turn to page 32......sh*te, turn back to page 18 and prevent page 32 never existed! Great thread ! I had a trip down memory lane a few years back, regretted selling all my originals so set off to buy all of them, got all 61 i think it is ? Theres a new book coming out later this year by Ian Livingstone apparently. Also have the Sorcery series, they were superb, huge books, Khare - Cityport of traps i think it was called, memories !! I was buying their apps on iOS but was annoyed they only released a few and then gave up (Even more annoying they released just the first book of Sorcery). Theres actually a new series of similar books on iOS which are pretty good, but shame about the original Fighting Fantasy ones. But theyre still great to read now, my mum loved buying me these back in the early 80's as i used to hate reading apart from these. The early books were the classics though, specially those first 3. I started buying these from the moment they first appeared (sometime in '82 I think) and got the first two dozen or so, then gave up on them as adventure and rpg-style games on the home micros improved. The books were fun for a while, and I seem to remember there was a four-part series (Sorcery!) which was also quite good. My personal favourite was Clash of the Princes - it could be played with two people simultaneously and the quests overlapped. 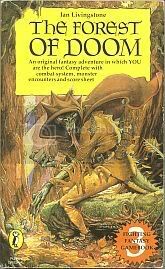 I'm sure I had a book which was like a beastiary of all the monsters from all the books..... or was a D&D thing? djcarlos wrote: I'm sure I had a book which was like a beastiary of all the monsters from all the books..... or was a D&D thing?